I hate to say it, but there are more important things to worry about than who might or might not have been robbed of a chance to sprint for second place in Stage 2 of the 2010 Tour de France. And my own opinion of today’s events? I’m ambivalent. This is only Stage 2 and there is a lot of racing remaining. If today’s sprint went anything like yesterday’s, we might have lost even more of the men we were hoping to see sprinting today. Suppose Armstrong/Contador had hit the deck and Astana/Radio Shack upped the pace to make the gap stick—wouldn’t many of us now be complaining about how unsportsmanlike it was? I know I would—hence my apprehension at criticizing anyone today. In a sport that was quick to criticize Mark Cavendish for his actions in the Tour de Suisse, some of us might want to be careful how quickly we judge Cancellara. What might be aggressive racing to some is unsportsmanlike to the rest—it’s all relative. The Tour will go on—by the time it hits the pavé tomorrow, we’ll all have forgotten about what happened today. This entry was posted in Races and tagged A. Schleck, frank schleck, stage 2, Sylvain Chavanel, tour de france, wiggins. Bookmark the permalink. I’ve been reading (and watching) a lot of interviews saying there was oil on the road, or at least something like oil. Riders crashing and then immediately crashing again. Sounds suspiciously like sabotage to me. I’m not a conspiracy theorist in the slightest, but Tour riders have been sabotaged in the past. And a steep and narrow descent covered in oil gives one pause. Or perhaps it was simply a case of untimely rains bringing embedded road oil to the surface? Hard to say. My guess though, is that more than a few riders will be spooked by the day’s events. Garmin’s DS Matt White made a similar statement. He was also quick to point out that these roads are good enough for L-B-L, so why aren’t they good enough for Le Tour. We were in Stavelot (30km from the finish). The peleton looked as if they just emerged from a battle. Lots of blood, torn jerseys and shorts and a lot of shell-shocked faces. No oil on the roads. Just slickness after the few heavy showers we had in the hour prior to the peleton’s arrival. The roads everywhere in the forest were slick. Even too slick for my Subaru Outback at times. I believe they went down the Stockeu on the road they normally go up in LBL. I’ve walked up that road and it’s long, straight, narrow, and incredibly steep. It seems unnecessary to me that they include a feature like that in the Tour. Going up that climb would have made more sense, but given the conditions, I wonder if many would have been walking. Are you using the Magic eight ball for your answers? Matt White’s comment seems a little odd. LBL is not the Tour and if Bill is correct that the riders go up this section of road, it seems to make Matt’s comment silly. And, even if it goes down that section, there is probably 15-20 riders at one time as the classics seem to spread people out all over the course. The Tour has 197 people at once trying to use the same piece of tarmac. 5. peloton hits the downhill straightaway (nothing dangerous there, it’s a straightaway for god’s sake) at 60kph, hit oil that was running down tarmac. 10. Cervelo peaved off? It is their right, they had riders burying themselves on the front for quite awhile controlling the pace. Some boys went deep for no reason and no reward. Not justifying how angry they are, but certainly understand their point of view. 11. What happens if GC riders crash out on the cobbles tomorrow? What if Contador crashes but no other GC boys have issues, will they hold up for him? This has opened a potential big can of worms. 12. 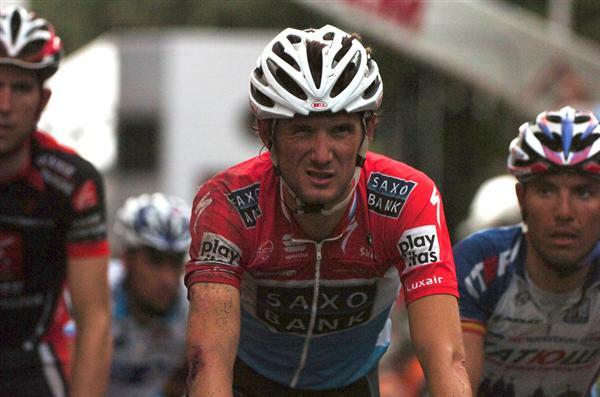 Lasting image of the stage for me – Jens Voigt deep in the pain cave killing himself to bring the Schleck bro’s back. Unsung hero of the day. 13. Farrar still in the race tomorrow with a fractured wrist? If he can make it through the cobbles with that he can make it all the way to Paris. So much happening, so many potential pitfalls and problems to come tomorrow. Drama in a race is good, but this is not the right kind. I’d also point out that if they were truly noble in their intentions, Cancellara/Saxo would have waited for EVERYONE to catch back on – Petacchi, VDV, Farrar etc etc…..the more I think about it the more I think this has turned out to be a Bjarne Riis Directeur master class. 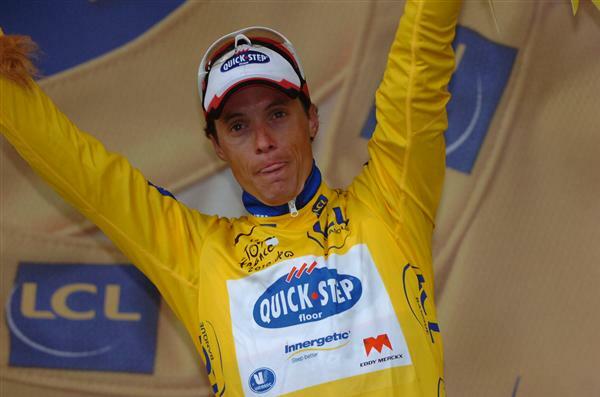 If the race director was truly noble about the whole thing, they would rescind the points given Chavanel, and would also give him a symbolic 1 second advantage over Cancellara for the yellow. Bulls**t. And Hushovd sat there among the very first men off the Stockeau and he’s not supposed to sprint for points? Cavndish was dropped way before the climbs (he’ll probably blame this on Greipel, class act that he is) and there could have been a 40-50 points difference here. What I’ve heard/read is that there was oil on the street from a crashed motorcycle which came down after avoiding a crashed rider. But it is right what ml said, they ascent that climb in LBL, and that is the only true way of riding that col, you always climb up to Eddy. I think the Tour should have done it that way, too, because even in dry conditions there would have been riders crashing on that descent. While I can understand the riders being upset about this inclusion of the “wrong” and dangerous riding of the Stockeu and taking out pace until all teams and GC contenders have rearrange themselves, which happened before the last summit, I have no understanding why they did not continue racing afterwards, because all the streets then were safe and good for Belgian standards and those few sprinters and domestics who didn’t make it back, well who cares about the time of the domestics, and angry and frustrated sprinters, they were anyway. It was a bit frustrating for the spectators aswell, whom been waiting or riding for hours through the rain to get there. It was really an extraordinary situation which needed some extraordinary measurements, and the race direction didn’t react (quickly enough), but completely canceling the racing afterwards wasn’t really anything that had to do with respect and fair play in my opinion. A kind of neutralisation phase, ok, seems appropriate and necessary in that case, and a official protest of the riders organisation afterwards would have been much better choice. They all have race radios. So it would have been easy for the race direction to tell all DS the race is neutralised and those their riders and then keep the distance between Chavanel and the field at the time gap as the crash occurred.And then restart again after all/most things have been sorted out. At first, I had no problem with what the riders did. Now, while I still support the riders “in theory”, I feel–like some of you–that there would have been a better way to go bout it “in practice”. They effectively did what they needed to do by waiting as long as they could for “everyone” to get back on. Sure, there were some left WAAAY behind, but the race radio’s aren’t always accurate. And Petacchi? Well, the video I saw looked clearly like he was answering nature’s call–so no sympathies from me there. While Riis might have had a role in getting the field to sit-up 20km from the end, I doubt he was the impetus behind doing it at the finish—he had no reason to. Any crashes inside 3km would not have led to time gaps, and all of his men had made it back to the field. Clearly the commissaries had no intention of cutting anyone. So in the end, this might just be a sporting case of good intentions, bad excution. With the fans who waited all day to see some action getting the worst of it. But I still say, if the shoe were on the other foot, and Saxo Bank went to the front after the climb and drove it while Lance/Contador/Basso were picking up the pieces, “we” would have vilified them for that to. Join me today over at Bicycling’s Live Blog. Will be great to have some familiar faces! 1) This is professional bike racing, they are the best at what they do. They know the profiles and routes well before the race; any complaints should be lodged well in advance. They are not oppressed coal mine workers from the 1800s, and should stop acting as such. If you don’t like the parcours, don’t enter. 2) In theory I have no problem if the patrons collectively decide to wait for those affected by the crashes in a show of fair play. How that gets implemented is another matter, and someone will always be unhappy with how it was done. 3) However, after the group is back together, the racing should resume. There was no reason to not sprint it out. GC may not have been affected, but certainly the points competition was, as where the fans and sponsors.